Does the photo below drive you up the wall? Do you suffer from Obsessive Compulsive Disorder? 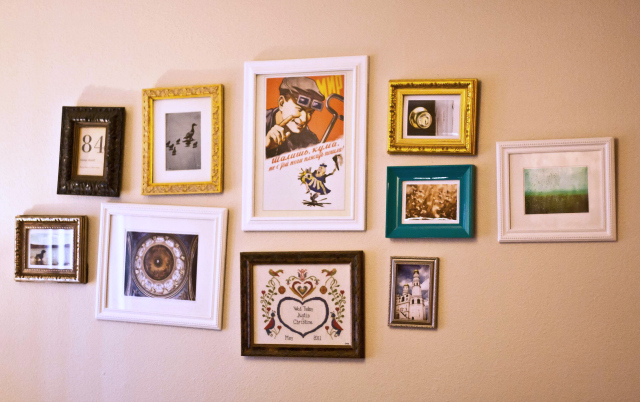 Do you have an uncontrollable urge to fire up Photoshop and digitally straighten all the picture frames? Wait! Don’t pull your hair out. The Hang It Perfect picture hanger tool is just the tool for you. Hang anything, pictures, mirrors, shelves, wine racks, towel racks, TV brackets and much more with just 3 simple steps and in just one minute. Measure it. Mark it. Mount the hanger. The Hang It Perfect tool ensures that your wall decor is positioned and lined up perfectly every time. We’ll let the video below do all the explaining. Hang it Perfect is the revolutionary new product that allows you to align, level, and hang wall decor with ease, in just 60 seconds. Hang it Perfect is the only product on the market that will adapt to any hanging hardware and can easily hang multiple items in a horizontal line or grouped pattern.